Another system making the most of your space available. Warehouse partitioning systems offer Anti-collapse rear mesh protection on Pallet Racking, & machine mesh guard protection. Mesh wiring may be used for wire shelving, as a very reliable storage solution. Mesh partitions are a cost effective storage solution. A unique way of storing warehouse materials, & equipment. With a durable modular design, mesh partitions can be used as enclosures, or barriers. 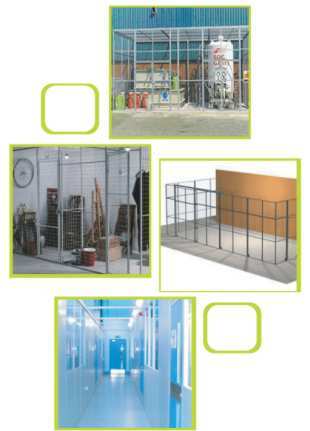 Mesh partitions offer excellent protection for storage of products, & equipment. Mesh partitions allow complete visibility of products, or equipment while also keeping inventory secure. Built with quality materials, mesh partitioning, & mesh storage is more resistant to damage, & is a long lasting storage solution. Installation of mesh partitions is faster than other traditional storage solutions, & can be easily maintained. The system can be relocated to a different area within your warehouse, depot, or factory giving you a modular system. The partitions may even be installed on Mezzanine Floor. Make efficient use of your space with warehouse mesh partitioning systems. If you have changing storage needs, & need a more cost-effective solution for future partitioning systems within your warehouse. We can advise on interior and exterior space conversions to meet Health & Safety guidelines. JJ Storage Systems offer complete warehouse planning consultancy. Our expert advice can save your company money; make more efficient use of your storage space, & give you secure mesh storage systems within your warehouse.